It’s a dang use­ful tool. I have recent­ly tried this on my Mac­Book Pro (as the client) to work along my work Mac 24″ and my new rig at home (as the serv­er). Syn­er­gyKM is a GUI wrap­per around the syn­er­gy com­mand line tool that lets you eas­i­ly share a sin­gle mouse and key­board between mul­ti­ple com­put­ers with dif­fer­ent oper­at­ing sys­tems with­out spe­cial hard­ware. Down­load and install Syn­eryKM to both machines. The install should put Syn­er­gy in your “Sys­tem Pref­er­ences”. 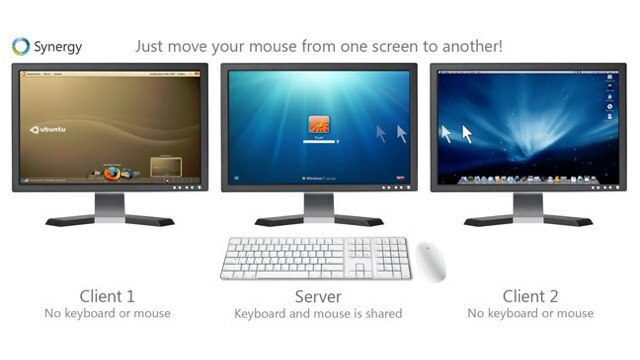 To make the machine a client, click on the option with “Con­nect to a shared key­board and mouse”. It should be intu­itive enough. In “the client” machine(s), you are instead click­ing on the “Client Con­fig­u­ra­tion” tab. Enter either the Serv­er IP or host­name of “the serv­er” machine. Last but not least, you just need “Turn Syn­er­gy On” and that should do it. Note: If you have upgrad­ed to at least Leop­ard v10.5.2, you will need to make sure that “Enable Bon­jour” option is turned off. There seems to be a prob­lem that caus­es Syn­er­gyKM to not work cor­rect­ly with it enabled in this ver­sion of Leop­ard. Any­ways, I’ll see if I can write up the steps to get­ting your PC/Windows machine work­ing when I get a chance lat­er. For now, soak in the glo­ry of using just a key­board and a mouse to con­trol your machines. I have updat­ed this post with the lat­est links to the projects men­tioned above. As of the time of this writ­ing, I am using the lat­est Syn­er­gy 1.4.5 Beta 64-bit on my PC (the serv­er), and Syn­er­gyKM 1.0 Beta 7 (1.0b7, as the client).